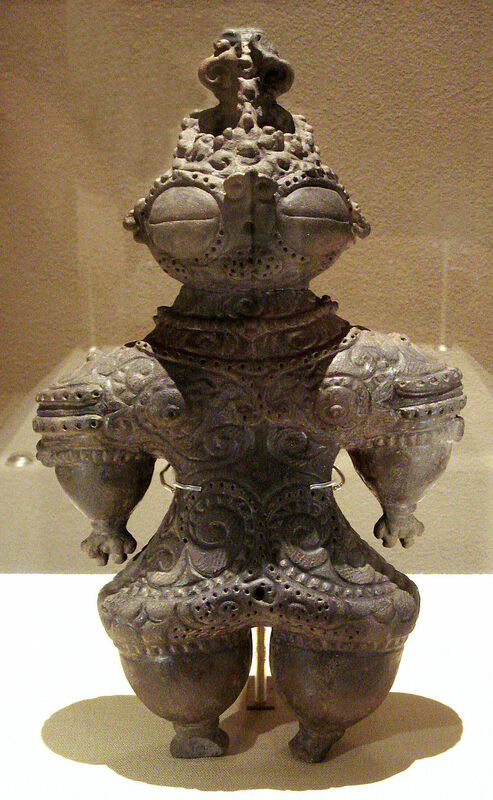 The so-called Dogu are relatively small humanoid figures made at the end of the Jōmon period (14,000-400 BC) in Japan. The curious figurines have a number of strange characteristics that make them some of the most unique pieces of ancient art on the surface of the planet. What do the Dogu have that makes them so mysterious? Well, if you look at them, they kinda’ resemble some sort of humanoid wearing a suit? Maybe a spacesuit? The figurines are depicted with helmets or goggles. They are also depicted having strangely shaped ‘elongated’ heads, and some of them have almond shaped eyes. The eyes are nearly always depicted disproportionally in relation to the body. The most interesting part perhaps is the fact that the Dogu Figurines are meant to represent the ‘Gods’. , Japan. Image Credit: Wikimedia Commons. 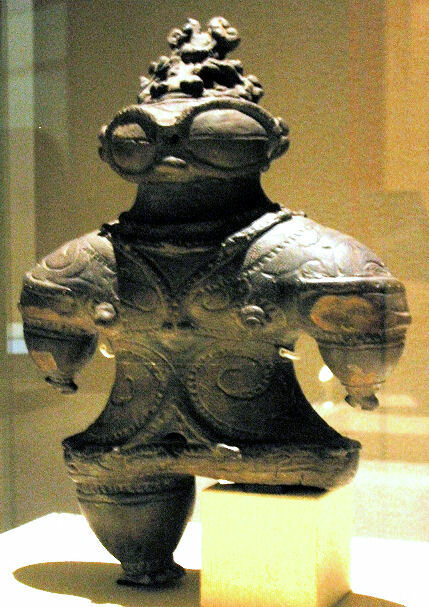 Most Dogu figures have breasts, small waist, and large eyes and are considered by many to be representations of goddesses. Many have a large abdomen associated with a pregnancy, suggesting that the Jomon considered them to be mother goddesses. Made of clay, these figures take on many fascinating forms. The Dogu tend to have large faces, small arms, hands, and a compact body. Some seem to wear glasses or have “heart-shaped” faces. Most have marks on their faces, chests, and shoulders. Nearly all of the Dogu figures have been discovered in graves or stone circles, indicating through the location they were discovered in, some sort of religious or shamanistic use. Dogū, Ebisuda Site in Tajiri, Miyagi Prefecture, 1000–400 BC. Image Credit:Wikimedia Commons. Another interesting fact is that the Dogu figurines are believed to be exclusive to the Jōmon period and disappeared in the next historical period, the Yayoi period. Regarding the Jomon ceramics, the Dogu have several styles depending on the area and type of associated exhumation. According to the National Museum of Japanese History, researchers have recovered around 15,000 Dogu figurines so far. Most of the Dogu have been found in eastern Japan and it is rare to find any in the west of the country. Despite the fact that the figurines were associated with the Gods, the exact purpose of the Dogu is not yet clear, but most likely the Dogu acted like the effigy of people manifesting some kind of magic or shamanic purposes. As noted by Timothy Insoll, author of the book “The new hakodate jomon culture center, minamikayabe, Japan” it may have been believed that illnesses could be transferred into the Dogu, then destroyed, clearing the illness, or any other misfortune. Well, what’s the difference, right? Ancient Astronaut theorists offer interesting explanations. Some authors believe that these figurines represent otherworldly visitors, extraterrestrial beings that came to Earth thousands of years ago. The Dogu figurines appear humanoid but are certainly anything but human. The mysterious ‘suit’ that some of these figures appear to wear, helmets, and what some describe as goggles are just a few of the characteristics unfamiliar with that period in human history. This raises a few interesting questions: Did the ancient artists see beings that resembled the Dogu? Or are the mysterious figures the result of ancient mankind’s imagination? Given the enigmatic nature and peculiar characteristics of the figurines, the Dogu have been part in numerous controversial theories. As noted by popular researcher and best-selling author Erich von Däniken, the Dogu (referred in the text as the “Japanese statue of Tokomai”) “…have modern fastenings and eye apertures on their helmets”, an attribution made in the final chapter of his 1968 book Chariots of the Gods?.